Every once in awhile there is a commercial with a song that I just can't get out of my head. Apparently I wasn't the only one wondering about the lyrics to the McDonald's Filet O'Fish song. Aaron caught me singing it and he accused "You googled the lyrics didn't you?!" Hahah, I haven't seen that one! Ha ha ha! I had my husband find me the video for this commercial just yesterday on YouTube 'cause I keep getting the darn song stuck in my head. 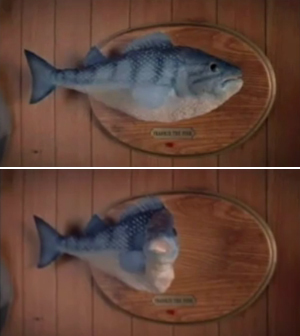 I think the fish is creepy (like the big-headed Burger King guy from commercials a while back) but can't stop singing the song. I've had that song stuck in my head all day too! The guy who wrote and sings that song is from Rochester. He has also written songs that were played during Scrubs. OMG that is so funny! Ben and I sing that commercial song all the time! Too funny my son set this as his ring tone!